A Swift version of this article is available here . Following the many requests on Reddit, here we go with the first article about custom controls. Thanks for suggesting it! For example, what if you want to build a control to help the user select an Angle value between 0 and 360? A solution would be to create a circular slider and let the user drag the knob to select the angle value. This is something you’ve probably already seen in many other interfaces but nothing similar is available in UIKit. That’s why this is the perfect example we can use to set aside UIKit and build something special. But first, here’s a sneak peek of what we are going to create. The UIControl class is subclass of UIView and it is the parent of every UIKit control (such as UIButton, UISlider, UISwitch and so on). The main role of UIControl instances is to create a logic to dispatch actions to their targets, mainly (like 90% of the times) using a specific user interface which draws the control depending on its state (i.e. Highlighted, Selected, Disabled…). we define a User Interface (the circular slider itself) the user can interact with (he moves the knob). User’s decisions are then converted into actions for the control’s target (The control converts the knob frame origin in a value from 0 to 360 and it applies the target/action pattern). We are ready to open XCode. I suggest you to download the full project at the end of this article and follow this tutorial reading my code. We will go through the three steps that I have listed previously. These steps are completely modular, it means that if you are not interested in the way I drew the component, you can just skip to steps 2 and 3. Open the file TBCircluarSlider.m to follow the next sections. I love Core Graphics and I want to create something that you can customise further in your experiments. The only part that I want to draw with UIKit is the textfield which presents the slider value. Warning: some Core Graphics knowledge is needed, but you should be able to read the code anyway, I will explain as much as I can along the way. Let’s analyse the different parts of the control to have a better view of how it’s drawn. 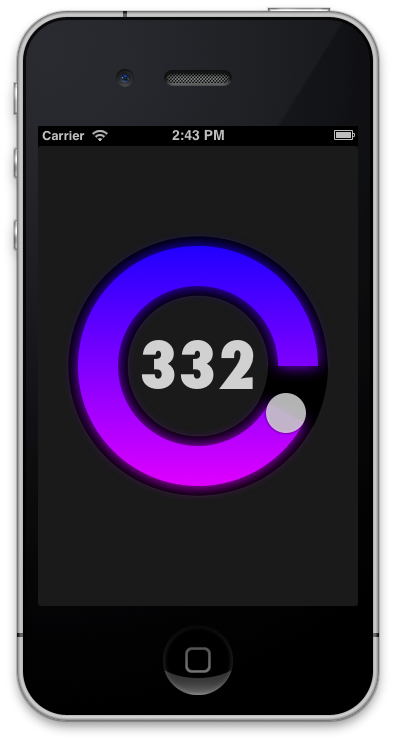 First, a black circle which defines the slider background. The active area filled with a gradient from blue to violet. The handle which is dragged by the user to choose the value . And last, a TextField to indicate the selected angle. In the next version it will also receive values from the keyboard. To draw the interface we mainly use the drawRect function, where the first action is to get the current graphic context. The background is defined by a 360° Arc. This can be simply drawn adding the right path to the context CGContextAddArc and adding a stroke to it. The function CGContextArc takes the coordinates for the center of the Arc and the radius (a private int variable). Then it needs the start and the end angle expressed in Radians (you can find a list of Math helpers at the top of the file TBCircularSlider.m) and the last parameter is the drawing direction, 0 means counterclockwise. The other rows are just settings, like colour and line-width. And finally we draw the path using the function CGContextDrawPath. This part is a little tricky. We draw a linear gradient masked by an image. Let’s see how it works. The mask image works as a hole through which we can see only a portion of the original gradient rectangle. An interesting aspect is that this time the arc is drawn with a shadow, that creates a mask with a sort of blur effect. Again we draw an arc, this time depending on the current angle. For example if the instance variable angle is equal to 360° we draw a full arc, whereas if it is 90° we only draw a portion of it. At the end we obtain an image from the current drawing using the function CGBitmapContextCreateImage. This image will be the mask. 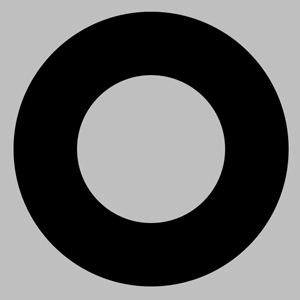 Now that we have the mask we can define “the hole” through which we’ll see the gradient. We clip the context using the function CGContextClipToMask and passing to the function the mask we have just created. Thanks to the mask only a part of this gradient rectangle will be visible. As a plus, I added some light effects to simulate light reflections on the background borders (this is optional… you can see how to do that taking a look at the project code). Now we want to draw the handle at the right position for the current angle. This step is really simple in terms of drawing (we just draw a white circle), but it needs some calculations to obtain the handle position. We have to convert a scalar number into a CGPoint using trigonometry. Fear not, it’s just a matter of using Sin and Cos prebuilt functions. Given an angle, to find a point on a circumference, we also need the center of the circumference and its radius. Using the sin function we obtain the value for the Y coordinate and using the cos function the value for the X coordinate. Remember that each function returns a value for an hypothetic radius of 1. We just have to multiply these results for our radius and move those in relation to the centre of the circumference. Saving the current context (it is a good practice to save the context state when you do drawing actions in a separate function). Setting some shadows for the knob. Defining the knob colour and draw it using the function CGContextFillEllipseInRect. We call this function at the end of the drawRect function. We are done with the drawing part. Subclassing the UIControl class, we can override 3 special methods providing a custom tracking behaviour. When a touch event happens in the control bounds, the method beginTrackingWithTouch is first sent to the control. It returns a BOOL which determines if the control needs to responds when touch is dragged. In our case we need to track dragging, so we return YES. This method takes 2 params, the touch object and the event. This method return a BOOL indicating if touch tracking should continue or not. We can use this method to filter user’s actions depending on the touch locations. For example, we can choose to activate the control only if the touch location intersects the handle position. Not the case of this control, though, because we want to move the handle in response of any touch position. For this tutorial this method is responsible for changing the handle’s position (and as we’ll see in the next section it sends the action to the target). At first we take the touch position using locationInView. Then we pass it to the function moveHandle which converts the value to a valid handle position. What I mean with “a valid position”? The handle should be moved only within the circumference boundaries defined by the background arc. But we don’t want to force our user to move his finger within this little space to be able to move the handle. The experience would be really frustrating. So we’ll accept any touch position and translate it to the slider’s circumference. The function moveHandle does the job, plus, in this function, we perform the conversion which gives us the angular value of the slider. //Calculate the direction from the center point to an arbitrary position. Most of the work is done by AngleFromNorth. Given 2 points, it returns the angle of the imaginary line to connect them. (Note: I’m not the author of angleFromNorth, I took it directly from an example by Apple for OSX called clockControl). Now that we have the value expressed in degrees, we store it in the property angle and we update the textfield value. The function setNeedDisplay ensures that the method drawRect will be called, as soon as possible, with these new values. This is the function fired when tracking ends. For this example we don’t need to override this function, but it would be useful if we needed to perform operations when the user finishes interacting with the control. At this point the Circular Slider is working. You can drag the knob and see the value changing in the textfield. Now. If we want to be consistent with the UIControls’ behaviour we have to notify when the control value changes. To do that we use the function sendActionsForControlEvents specifying the event type, in this case UIControlEventValueChanged. There is quite a long list of possible values (cmd+mouse click on UIControlEventValueChanged from Xcode to see the list). For example, if your control is a subclass of UITextField, you will be interested in UIControlEventEdigitingDidBegin, or, if you want to notify a touch Up action, you can use UIControlTouchUpInside. sendActionsForControlEvents just before the return within function continueTrackingWithTouch. Thanks to that, when the user moves the handle changing the slider value, each registered object will be notified about this change. 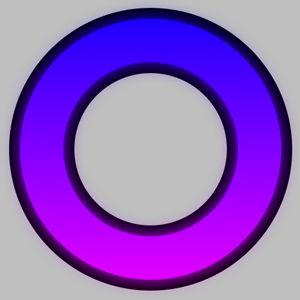 We have now a custom control that we can use in our application. We simply define a backgroundcolor and we instantiate a circular slider object adding the frame information calling initWithFrame. Nothing more than what we do with a UIView (remember: UIControl is subclass of UIView, so it inherits every UIView method). We are working with the Target-Action pattern, so the function receives the sender which has called the action, in this case the slider. We can directly access the angle value and, for this simple example, just log it. You can create WHATEVER YOU WANT, starting from the steps I have shown you in this tutorial. There are probably many other ways to build something like this, but I’ve tried to follow Apple’s suggestions, showing you only the 100% “documented way”.